Izmir University of Economics (IUE) Vocational School organized a series of conferences titled, “The Campus of Finance and Development”. The event started with opening speeches of IUE Rector Prof. Dr. Can Muğan, and Burçin Önder, Director of IUE Vocational School. The keynote speaker Halit Soydan, Lecturer at IUE Department of Economics, and Former Managing Director of Yapı Kredi and Garanti Banks, pointed that many successes were achieved in commercial banking under Turkey’s conditions; however, the capital market did not improve. Soydan reminded that the Derivatives Exchange, which was established in Izmir and later on moved to Istanbul, Istanbul Gold Exchange, and Istanbul Stock Exchange joined in 2013 as Borsa Istanbul-BIST (Istanbul Stock Exchange). Soydan said, “They claimed they were going to make Istanbul the center of global finance. They created an exchange called BIST, and we are still lagging behind. We rank 33rd-34th place among world exchanges. Transactions in banks are short-term transactions. Whereas, the economy, including the public sector, needs economic growth through medium and long term stock certificates and bill of debts from various forums. However, we understand one thing when we talk about investment. Investment means establishing factories. However, the West and world’s largest money markets do not agree. Investment is the name of the activities of the capital market”. Soydan stated that banks in Turkey made their customers use the funds they obtained from foreign banks through syndication. 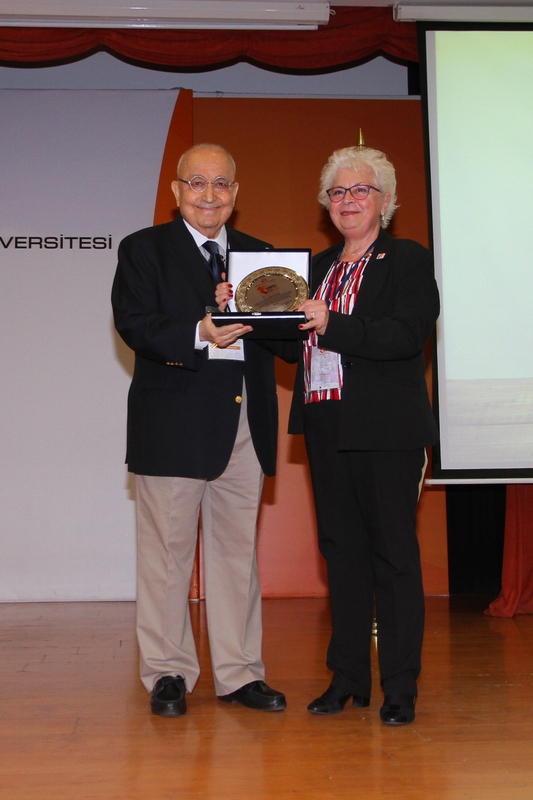 IUE Rector Prof. Dr. Can Muğan presented “The Star in the Profession” award to Soydan, an award granted by the students of IUE Vocational School. Journalist/Economist Emin Çapa joined the “As You Build Your Future” titled talk. Çapa indicated that the science acted upon with “what if’s”, and he asked the students to stay loyal to science and research. Burçin Önder, Director of IUE Vocational School, presented Çapa “The Economist of the Year” award on behalf of the students. IUE Secretary General Levent Gökçeer moderated “A Sectoral Overview: Banking” titled session where İlhan Küçükahmetler, Deputy General Manager of Agricultural Banking, Anadolubank, and Bülent Köle, Department Head of Agriculture Banking, Anadolubank, participated as speakers. Atilla Ertekin, District Manager of Western Anatolia, Anadolu Sigorta, and Barış Orhunbilge, District Manager of Aegean, AXA Insurance Co. shared their opinions in the “A Sectoral Overview: Insurance Business”, titled session moderated by Assoc. Prof. Arıkan Tarık Saygılı. Burçin Önder moderated “A Sectoral Overview: Real Estate Sales and Marketing” titled session where Gökhan Taş, Regional Chairman of Turkey & Cyprus , Coldwell Banker, and Çağrı Bozay, Executive Board Member / Chief Sales Officer, Hürriyet Emlak, participated as speakers. Şaban Çağıran, Group Manager of Appraisal and Real Estate Management, Denizbank, Makbule Yönel Maya, General Manager, TSKB Real Estate Appraisal Company, and Neşecan Çekici, Real Estate Management Chairman of the Board, EPOS, attended the “A Sectoral Overview: Real Estate Valuation” titled session. Ersun Bayraktaroğlu, Leader of PwC Turkey’s Real Estate Industry, and Muhterem İlgüner, Director of Brand Finance, Turkey, participated in “A Sectoral Overview: Emerging Trends in the 21st Century Real Estate Industry” titled session as guest speakers. Nur Banu Oğuz, Recruitment, Career and Talent Management Group Manager, Denizbank, Nazmiye Altındaş Balkani, Recruitment Director, Adecco Group, and Deniz Dedeoğlu Toktan, Perm Recruitment Team Leader, Adecco Group, attended “A Sectoral Overview: Human Resources” titled session. The conference series ended with Mine Erbaykent’s, Managing Director - Founder / HR & Management Consultant, MİKOR Human Resources and Corporate Coaching, speech on “Interactive Human Resources”.